Ever heard of a Potjie Pot? It’s the cutest cast iron chuck wagon pot you’ll ever see. I became a bit obsessed with the Potjie Pot when I was out at the Chuck Wagon Cook-Off in Chandler last month. There among the giant, industrial strength 45-quart Dutch ovens was this little pot that could. It has now become one of my favorite cooking vessels and the perfect pot for stews and chili. 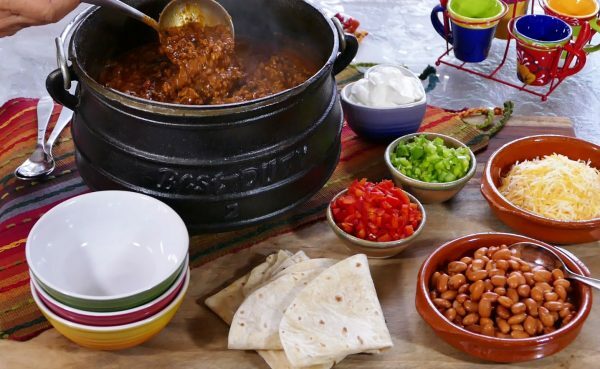 Now that we actually have some cooler weather in the evenings, a big ol’ pot of chili sounds great. My favorite red chili recipe comes from the man who knows a whole lot about food. Jack Clifford created the Food Network years ago and has been a die-hard foodie ever since. His chili has won awards and is a sure fire crowd pleaser at my house. Jack’s recipe feeds a pretty big crowd, so I’ve scaled it to a family sized portion. If you have company for the holidays, however, just double up on the ingredients. By the way, if you’re curious about the Potjie Pot, you can check it out at www.potjiepotusa.com. You can also check out Jack Clifford’s book, “The Least Likely To Succeed” on Amazon.com.